John used many such warnings [like Jesus will separate the wheat from the chaff] as he announced the Good News to the people. 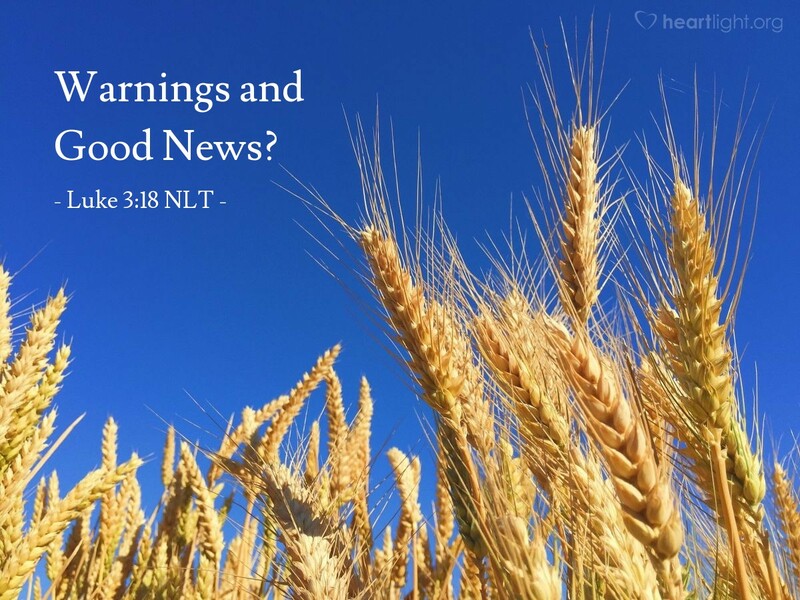 The warning in the previous verse (Luke 3:17) and "the Good News" in this verse don't seem to go together, do they? Hmm, how do they fit together? When everlasting life or eternal destruction are the only options, to reject the Good News about Jesus is to choose destruction. Each of the Gospels (Matthew, Mark, Luke, and John) emphasizes the radical nature of the choice we must make about the Kingdom of God and the coming of Jesus. Jesus is Good News. Jesus brings Good News. Jesus ensures Good News. However, if we reject Jesus and the call of the Kingdom of God, we must hear the warnings that go with that choice. In a world like ours, where few want ultimate choices, and the vast majority resents having to deal with lasting consequences of moral and spiritual choices, John the Baptizer's preaching still has a penetrating, an invigorating, and for some, an irritating, echo. Like it or not, Jesus confronts us with a decision about who will rule our lives. The choice we make means everything! Father, help me to hear the radical call of your Kingdom on my heart. I know that the message of Jesus is Good News! At the same time, I don't want to take it for granted or take lightly your call for me to live my life with holiness, integrity, honor, righteousness, compassion, goodness, virtue, and godly character. May your will reign in my heart and may my life reflect the Good News of the Kingdom to which you have called me. In Jesus' name. Amen.